I've been working on a 5310 Trojan. This fan did not work when I got it. I replaced the stator with one that had been rewound. I also disassembled and cleaned the centrifugal switch. The plates were cleaned and after reassembly it looked and worked like new. I also shined up the male contacts which only show a very slight wear groove. After reassembly, the centrifugal switch seems to have a "flat spot" of about a quarter turn where the motor will not start on its own. Thinking that perhaps the springs where too weak, I replaced them with a new set that I bought from Chad. Still no joy. I can hear the distinctive rattle of the switch until it disengages on startup and I again on shut down, so I know it's engaging and disengaging properly. The "flat spot" is always in the same place rotationally, so I'm assuming that the switch plates are not making contact properly when in that area of the rotation. Odd thing is that the motor almost acts like it want to start rotating in the wrong direction when attempting to start within the "flat spot" Could the problem not be the centrifugal switch and actually be a badly wound start coil? Does anyone have any suggestions on how to adjust a centrifugal switch? My issue was the sleve collar connected to housing where the switch plates engage was inwards on one side. Slightly bent it outwards by hand and that was enough to allow plate to make contact each time. No, I don't have any pics before I installed it and I'm really trying to avoid pulling the stator again. But, the groove was quite minimal. It actually is one of the least worn centrifugal switches that I've seen. I just spent another hour disassembling the rotor part of the switch and putting it back together. I thought maybe I had flipped the plates, so I did a comparison between to two, thinking that maybe they would be worn asymmetrically, and perhaps that was the issue. But they look so close to perfectly symmetric that I can't believe that would cause the problem. Anyway, I made sure that I flipped them before reassembly, but it made no difference. If I wind up pulling the stator, I'll take some pictures of the male part of the switch. I'm not a centrifugal switch expert but I do have some extra 5310 parts if that helps. Thanks for the advice. I took a look at the collar and the two halves look perfectly vertical and parallel to me. It also appears to be perfectly symmetric and round. I'll take some pics after while. I needed to step away from the thing before the rarity of this particular model increased by one. Is there any chance those springs are a bit too long? It appears that the contact on the right isn't drawn all the way in, and if it should come to rest at shutdown near the bottom of the fan, it might lose contact with the cone. Wow Darrell, that looks pretty clean. Something else you may try is to add a bunch of shims to shaft. Way more than needed one at a time temporarily just to position the plates on at a different location on the rear contact sleve. It will be out of its magnetic center but as a temporary set up will help locate a dead spot. When I was fighting my 11644 I would also back off my 4 nuts and tap on a table top to bring strator forward rather than completely remove. I tried everything before stretching that back contat collar outwards very so slightly. Tight springs, slacked springs, small washers replaced with deltron. Drove me nuts. it is aggrivating but you will figure it out. Just spent some more time with it. I removed the collar assembly. Fortunately I left the leads long enough that I was able to work with it without having to resolder them. To eliminate the groove in the collar as the problem I carefully ground the surface flat all around the outside of the collar. Like I said, the groove wasn't very deep. Still no luck. The new springs are identical in length to the old ones. The coil portion is longer, but the leads on the old springs were longer. I will probably try to shorten the original springs next and see if that helps. I'm getting really suspicious that I've got a stator that wasn't wound quite right. Does anyone know how a motor might behave if one of the stator coils was wrapped the wrong direction? Once this thing is running it seems to have a bit of a harmonic oscillation. That may be due to a slightly imbalanced rotor. The slight jump backward when attempting to start in the "flat spot" really makes me suspicious. 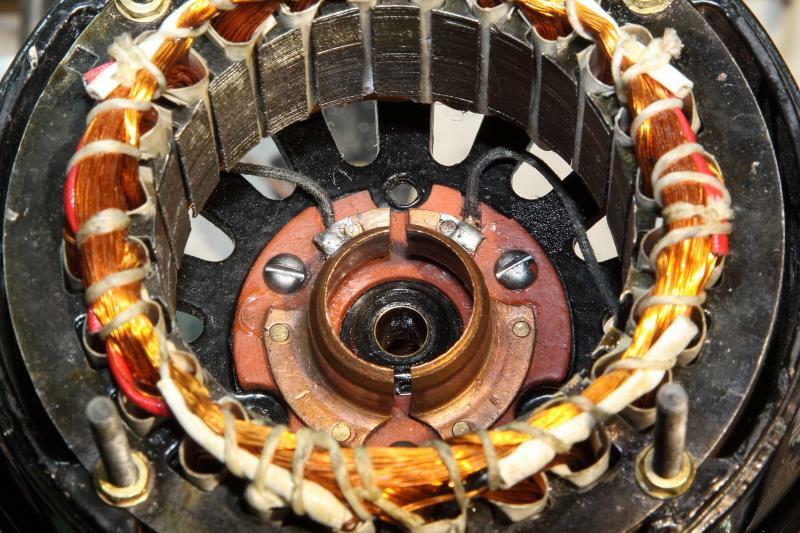 I wish I knew more about electric motors. Physics 3 was a long long time ago. Looking at your picture of the blades in post 7, I agree with Jim that your springs are too long. You can clearly see that the blade on the right is not drawn all the way in as compared to the left blade. You can unplug the fan, put an ohmmeter across the two prongs on the power cord, and turn the switch to high. At this point, you will be reading the resistance of the main run windings in parallel with the start windings. Slowly turn the blade. If the resistance reading increases at any spot, then you have found a spot where the centrifugal switch is not making contact. Also, some fans have two small flexible wires soldered on to the weights, connecting them to each other. This makes the switch more reliable. I couldn't find a picture, but I have seen picts on the forum. Drilling 2 small holes in each weight and adding the wires may fix your issue. I'm with Jim H. on this one. Appears the springs are not providing enough tension to close the contacts on the copper sleeve. I shortened the original springs and tried again. Works perfectly now every time. I guess the originals were a bit stretched and the new ones are just too long. David Hoatson wrote: You can unplug the fan, put an ohmmeter across the two prongs on the power cord, and turn the switch to high. At this point, you will be reading the resistance of the main run windings in parallel with the start windings. Slowly turn the blade. If the resistance reading increases at any spot, then you have found a spot where the centrifugal switch is not making contact. I'll remember that for the future. Darrell Koller wrote: You guys are awesome!! 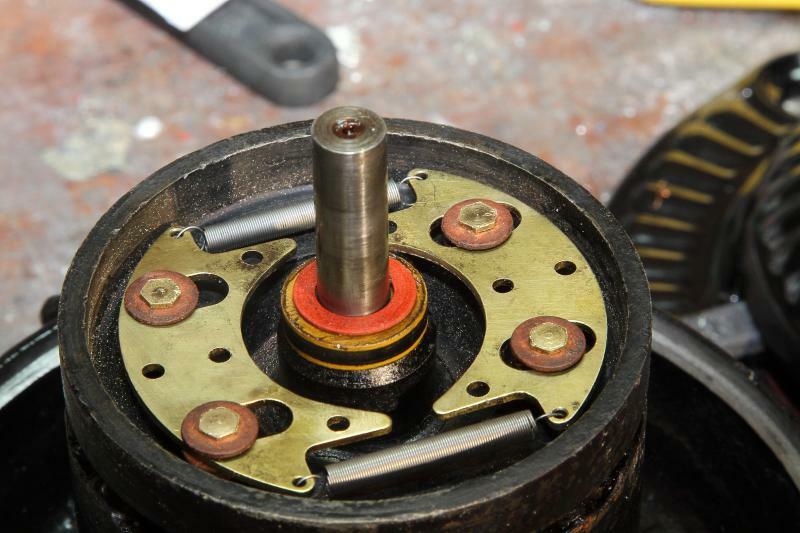 If the springs are too tight, the switch will not disengage, possibly burning out the start windings. Listen carefully. During startup, the switch should make a scratchy sound until the motor gets up to about 1/3 of its top speed, then get quiet. On shutdown, it should coast quietly and once the blade is about 1/3 of max speed, the scratchy sound should appear. The engagement speed is not important, just as long as the switch engages and disengages. Oops, David beat me to it, and did it better than me! Yep, I'm on it. Switch is definitely disengaging at about the right speed. Page processed in 0.1906 seconds (16% database + 84% PHP). 32 queries executed.